WIRE TAP: Our reporter gets a reading of his brain waves as the first part of Brain Music Therapy. Can the music of our brains make us sleep better? A South Bay psychologist says yes and is using mysterious Russian technology to treat patients with Brain Music Therapy. Our reporter gets strapped in to ride the waves. I'M RELAXING in a chair upstairs inside Suite 11 of the historic Kiely House in Santa Clara, a Queen Anne Victorian dating back to the 19th century. 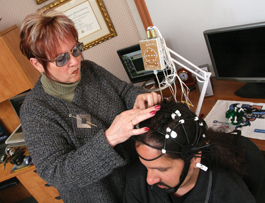 Dr. Sue Klear, a licensed psychologist specializing in neurofeedback, has just attached seven sensors to my head and face with an odorless skin-prepping gel to prepare me for the initial stages of Brain Music Therapy, an experimental treatment for insomnia, anxiety, depression and stress. 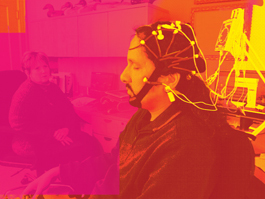 The treatment records an individual's brain waves using an Electroencephalogram (EEG), analyzes them and then converts them into two piano tracks—one "relaxing file" and one "activating file." These are eventually burned onto a CD for the patient to play while going to sleep and after waking up, the idea being that the musical sounds form a correlation to your specific brain waves in order to help eliminate imbalanced brain activity. So, theoretically, you end up sleeping much better and function more productively during the day. Originally developed at the Moscow Medical Academy as a nonpharmacological method for treating insomnia in the early '90s, Brain Music Therapy has received a boost from some scientific evidence of its effectiveness, including randomized double-blind studies in small-scale groups. It is now used on an experimental basis throughout the world to treat a variety of neurological scenarios including post traumatic stress disorder, attention deficit disorder (ADD) and withdrawal symptoms from drug or alcohol dependence. The Russian-born Dr. Galina Mindlin received the exclusive rights to provide this treatment in the United States in 2004 and has now treated hundreds of patients through her private practice in New York. Twenty other doctors throughout the United States now use the therapy as part of their practice, and Dr. Klear is the only one in the Bay Area who uses it. She runs her practice out of Suite 11 in the Kiely House. Here's the procedure: Dr. Klear first takes me through a basic medical evaluation, which includes me filling out two questionnaires, the Beck Depression Inventory and the Subjective Sleep Scale. Then I sit in the chair while the sensors are placed at key points to pick up my brain waves. This part of the procedure takes about five minutes and Dr. Klear throws some tranquil ocean sounds into the stereo to help me relax, the idea being that the patient needs to be in as relaxed a state as possible during the EEG, so the proper brain waves are recorded. She even closes the window to block out the traffic sounds from outside. My brain waves are then recorded into the software and Dr. Klear sends the files off to the main center for Brain Music Therapy in Moscow. Since the Russians apparently have a patent on the algorithm that converts the brain waves into musical sounds, that part of the process must be done in Moscow and nowhere else, which adds to the conspiratorial Cold War–esque-KBG-mind-control-outer-space quality of this entire scenario. Before succumbing to the EEG, everyone has to sign a "Brain Music Informed Consent," which includes this statement: "I agree to allow my personalized EEG recording to be emailed to Moscow so that my personalized recording can be created." Hmm. While sitting there looking the Cyrillic Russian printed on the panel of the amplifier to which the sensors are connected, I envision intelligence officials in the Kremlin crouched around a database of Americans' brainwaves with the intent of finding ways to put us all to sleep. I have to laugh, since by sheer coincidence—and I'm not making this up—I have just finished reading Smiley's People by John Le Carré, a legendary spy novel containing numerous references to the "Moscow Rules," which are universal unwritten canons of spook tradecraft. In the initial stages of the tale, Smiley keeps bringing up the Moscow Rules over and over again. They remain in my head throughout this treatment. A HEAD DOCTOR: Santa Clara's Dr. Sue Klear is the only Bay Area practitioner of Brain Music Therapy. Roughly 20 other doctors around the country use the treatment for sleep disorders. All scientific-speak aside, sleep is usually described in five stages. Crudely simplified, stage one is that gray fuzzy area between being awake and being asleep; during stage two, your temperature and heart rate continue to decline; stage three and four are, respectively, the transition into deep sleep and then the deep sleep itself; and stage five is the Rapid Eye Movement (REM) stage, where dreams occur and your brain activity is pretty close to what it is when you're awake. After REM sleep, the stages repeat, but not always in the same sequence. "What happens in stage three and stage four is that this is renewal and restoration of the body," Klear explains. "Muscle repair and tissue growth. It activates the immune system and defends against infections. And also what it does is it cools down the brain so that the brain can calm down. And then in the REM sleep, this is the consolidation of long-term memories and brain restoration. So that all we've done in the day gets consolidated into long-term memory when we are able to have REM sleep." Klear believes Brain Music Therapy can be particularly useful locally, where the fast-paced valley lifestyle can lead to chronic sleeping problems. "One of the problems with what's going on in our society in Silicon Valley today is we're not getting enough sleep," Klear says, "whether it be because we can't go to sleep because out minds are always in drive or we physically can't get there. So what happens is these five stages of sleep are interrupted. And usually stage three, stage four and the REM are the ones that get shortcutted." Brain Music Therapy also attempts to aid those who are blessed with the giftedly unsystematic higgledy-piggledy neurology otherwise known as Attention Deficit Disorder. "What happens is we're teaching the brain elasticity," Klear explained. "It used to be believed that brains are not elastic after we're finished being adolescent. All brains are at idle. We're in neutral. And when we need to do something, we kick it into drive. When we're finished, it goes back to neutral because it burns up too much energy to be in drive all the time. So what happens with an ADD brain is that it's more difficult to kick it from neutral into drive. And that's why it takes a lot of activity, a lot of hyperness, a lot of movement, and these kinds of things, because you're attempting to get your brain to kick into drive." Which is precisely where impulsive behavior and hyperactivity, hallmark symptoms of ADD, come in. For example, many ADD adults often blurt out things before thinking first, they constantly interrupt or finish other peoples' sentences, or they abruptly and irritatingly change the subject in conversations. Not because they're dissing the other person, but because their brains are filled with so much hyperactivity that they find it impossible to wait until it's their turn in the conversation. They must speak now and not two seconds later. Klear says that Brain Music Therapy has been proven to help all this. "That's what neurofeedback does," she says. "It teaches elasticity, and that way it's easier to get into drive, it's easier to get it back into neutral. And so it works easier—like getting more oil into it. ... BMT is a form of neurofeedback [and] what it does is let the brain recognize its own rhythm, either at a slower rhythm to rest or a more activated rhythm to wake the brain up. ... It changes the rhythm of the brain and can alter certain brainwaves to break patterns—the wakefulness at sleep time, lower your stress reactions, activate your mind, help [you] focus, help with jet lag or calm the brain after a stimulating event." Dr. Mindlin originally began practicing Brain Music Therapy in New York and gradually began training physicians in other locations throughout the country. Since she received many calls from prospective patients in the Bay Area, a mutual colleague hooked her up with Klear in Santa Clara and she flew out to show Klear the ropes. "Since she had these people from Northern California that were interested in doing the Brain Music Therapy, she came out to my office and worked out of my office and we saw patients for two days straight," Klear explained. "And she did it on me as well. I wasn't going to be interested in getting on board unless I had some success with it. I wanted to see what it was all about, and I wasn't going to push it unless I felt that it was viable and I was going to spend the money to get involved. After I saw some results for myself, I became interested in becoming a provider." Marlene Bjornsrud, former general manager of the San Jose CyberRays women's professional soccer team and co-founder of the Bay Area Women's Sports Initiative, is one of Klear's patients and also a good friend. "Sue and her husband were huge CyberRays fans and wonderfully supportive for all the three years [the team existed]," she told me. "So we've maintained a friendship, and primarily she knew that I was having trouble sleeping." So Bjornsrud went through the therapy, Klear brought the CD over to her house and the rest is history. "It was very interesting to me because when she brought it over to my home, I immediately put it in my computer and listened to it," she said. "For me there was this immediate emergence of relaxation. There was an immediate effect. ... Literally, I just felt myself thinking, 'You know, I'm going to go take a nap.' ... [At the time] I didn't even think that much about it, but when I began using it, I loaded it on a little iPod and began using it that night. And I would say for the first month I never got through the six minutes of music before going to sleep." Now, if my brain waves are being translated into keyboard music, I imagined it would resemble a cross between five scenarios: 1. Avant-garde composer John Cage inserting bolts and screws into the piano strings to make cacophonous textures. 2. The Abominable Dr. Phibes at the pipe organ. 3. Classical pianist Glenn Gould humming loudly while he's playing. 4. Dr. Teeth from the Electric Mayhem on The Muppet Show. And 5. Liberace. But it didn't sound like any of that. Instead, it was a nine-minute polyphonic atonal piano passage, most of which was characteristically minor-sounding as opposed to major and rather murky and morose, but relaxing nevertheless. As I write this, I haven't felt any long-term benefits of the Brain Music Treatment, since it takes at least a few months of constant use, but I can absolutely vouch for its initial effectiveness. I was able to sleep much more soundly than normal. I don't even have to use it every single night. It's like a natural drug I can always turn to, one based on my own brainwaves. Bjornsrud related similar experiences. "Before brain music surfaced, I just had kind of accepted the fact that I just was not—at this point in my life—I was never again going to have that great long night of good sleep," she said. "And then the brain music happened. And it doesn't mean that I'll sleep for eight or nine hours—if I can sleep seven good hours, that's awesome. And that's what changed, and there's no side effects, and that's what I love. And I'll go periods of time without it. And I'm actually sleeping better, even without it. Part of me wonders if my body just needed to learn that it could slow down. It's not addictive in that way, but it's a helpful hand." Unlike certain medications, you do not become dependent on Brain Music Therapy. It's not addicting in any way, shape or form. You're using your own inner wirings to help yourself, as you see fit. "This doesn't have any side effects because it's strictly your brain," Klear adds. "It's your brain recognizing your brain. And so they haven't found any side effects to it yet. And I continue, myself, to use it. I go through periods of wanting to listen to it and [other periods] not bothering. It's not like it's going to be a cure-all. It's not like I'm instantly always going to be able to sleep. But it's a calmer kind of a sleep. It's a calmer going-to-sleep. And it's a calmer being-in-sleep sleep." The cost is $550, and a big downside is that no insurance anywhere covers this yet. "It's experimental," Klear said. "There haven't been any really, really large scale studies on this—you know, 25 people, 50 people—because all those big studies are paid for by the pharmaceutical [companies] and this is alternative. It's the same with neurofeedback." So what's next for Brain Music Therapy? What does the future hold? "The next stage is that I hope everyone will have it," Dr. Mindlin tells me over the phone in a thick Russian accent. "Because it will be easy to have your brain waves downloaded into your pocket and use it when you need it. If you have an argument with your boss, you can train yourself to your desired state. Everybody can use it, right? You don't even have to have insomnia or anxiety. Everybody will be able to use it to increase their productivity." So think about all those scenes in Philip K. Kick's Do Androids Dream of Electric Sheep? —the ones where he's tweaking the console on the Penfield Mood Organ. That just might happen some day. But aren't some very unsettling questions raised here? What are the Russians actually doing with this huge database of everyone's brainwaves? How do we know the next phase of this research won't find them developing technology to put us all to sleep or control our moods at their discretion? In spook tradecraft, another Moscow Rule tells one to never go against his gut, as it is your operational antenna. So at the end of this adventure, I had a gut feeling to reread some more spy novels. I checked out Goldfinger, one of Ian Fleming's James Bond books, and the second synchronicity happened. Again, I'm not making this up. Above the table of contents, I read these statements, ones that Auric Goldfinger said to James Bond, and ones that also appear in the Moscow Rules: "Once is an accident. Twice is coincidence. Three times is an enemy action." I was not about to let another coincidence happen, so there this narrative shall end. Case closed. But I just had to ask Dr. Klear if she had even considered the possibility of Brain Music Therapy being a secret ploy by the KGB to manipulate the brains of Americans. She replied, "You're drinking too much coffee, Gary, when you start thinking like that."